^ Data refer to the year 2009. World Development Indicators database, World Bank. Accessed on January 10, 2014. ^ 理事会委托委员会做出关于叙利亚和伊拉克边界研究的报告. World Digital Library. 1932 [2013-07-11]. ^ Syrian army tanks 'moving towards Hama'. BBC News. 2011年5月10日 [2015年5月18日] （英语）. ^ Syria - International Religious Freedom Report 2006. U.S. Department of State. 2006 [2009-06-28]. ^ SIPRI Arms Transfers Database. Stockholm International Peace Research Institute. [8 September 2011]. ^ Amos, Howard. News Analysis: Russia Damages Image in Arab Spring. The Moscow Times. 26 August 2011 [8 September 2011]. ^ Russian defense industry and arms trade: facts and figures (PDF). Centre for Analysis of Strategies and Technologies. pp 15. [8 September 2011]. ^ Meyer, Henry. Assad Ouster Bid May Unleash‘Chaos in Mideast,’Russia Says. Bloomberg. 2011-09-07 [2011-09-08]. ^ GCC recognizes Syria’s new opposition bloc. Al Arabiya. 2012-11-12 [2012-11-12]. 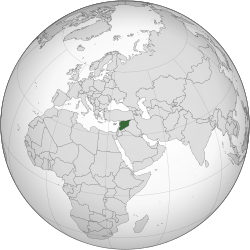 ^ 23.0 23.1 Arab League recognizes Syria’s new opposition bloc. Al Arabiya News. 12 November 2012 [13 November 2012]. ^ 24.0 24.1 Toner, Mark C. Formation of the National Coalition for Syrian Revolutionary and Opposition Forces. U.S. Department of State. 2012-11-11 [2012-11-12]. （原始内容存档于2012-11-16）. ^ Syrian opposition elects Hitto as provisional premier. Reuters. 18 March 2013 [19 March 2013].